I love a dish that you can just throw in the oven and leave alone for half an hour, especially when it tastes as good as this does. Heat the oven to 220°C, gas mark 7. Toss all the vegetables with 3 tbsp olive oil and the thyme, and season well. Arrange in an oiled roasting tin. Cut each poussin in half lengthways by cutting strongly down one side of the backbone. Place on top of the vegetables, drizzle with a little extra oil, season well and bake for 30 minutes until the poussin halves are golden and the vegetables are tender and lightly crisped. Give the vegetables a stir halfway through – if they become too dark, add a splash of water. 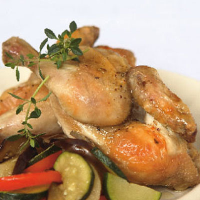 Serve two poussin halves on the vegetables and drizzle with the balsamic vinegar. The Corker recommends - Syrah has a wide appeal, and it blends with these Mediterranean flavours with uncomplicated ease.